The 420 Sport Coupé and its sister 420 Sport Bridge are both new models for this Pulaski, Wisconsin builder which offers ten models for 2013; eight flybridges and two sport coupes from forty-two to seventy-two feet. “The open-air salon and adjoining cockpit is designed for maximum access to the yacht’s ocean side environment. The salon entrance doors open to create one large environment combining the salon with the yacht’s cockpit. The innovative transom lounge easily glides aft with a push of a button to create more than 60 square feet of cockpit space.” Given the almost fourteen foot beam, this extended total area is akin to a dance floor affording guests a relaxing feeling with plenty of move around and “elbow” room. Even with this 4-adult sized lounge with storage below, in its forward position, there is ample 54 square feet of space here. Recessed lighting sets the entertaining or relaxing mood. The integral swim platform adds an additional 34 square feet to this area. Moving forward through the hinged port panel and bi-fold starboard panel of the glass entrance door from the aft cockpit, “The yacht’s salon features quality treatments such as exotic African Zebrano hardwood cabinetry with high gloss quality lacquered trim, wooden cabin sole and designer selected fixtures and appointments.” The “wooden cabin sole” is Brazillian cherry. The U-shaped starboard sofa hosts an exquisite solid wood drop leaf dinette table and converts to a double berth. Opposite is a settee and entertainment centre with a 26” LCD TV and full stereo system. Overhead are two manually opening glass hatches and these, combined with the glass entrance doors and huge side windows and forward windshield provide a most comfortable feeling of openness and brightness. Being a coupe, there is one helm station, on a raised base forward of the dinette, affording a panoramic view around the entire yacht. The double wide helm seat is power adjustable fore & aft with a flip-up bottom. The instrument cluster is compact with full digital screen readouts. 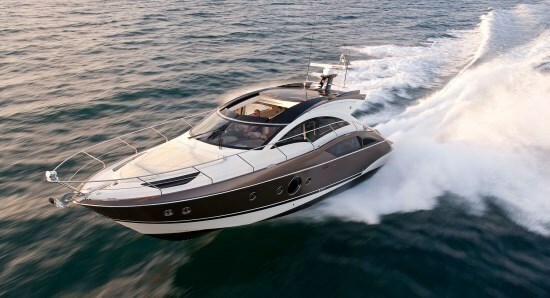 Power is “Built around Volvo’s innovative IPS propulsion system (and) the Marquis 420 Sport Coupe delivers an exhilarating ride at speeds in excess of 40 mph. The addition of the IPS Joystick allows the operator to confidently maneuver the yacht in tight quarters and while docking.” Steering and controls are electronic fly-by-wire. Opposite the helm, the galley includes a classy curved glass door liquor cabinet with glass shelves, microwave oven/grill, under counter 5.6 cu.ft. refrigerator/freezer, electric 2-burner range, sink, drawers, and storage cabinets. 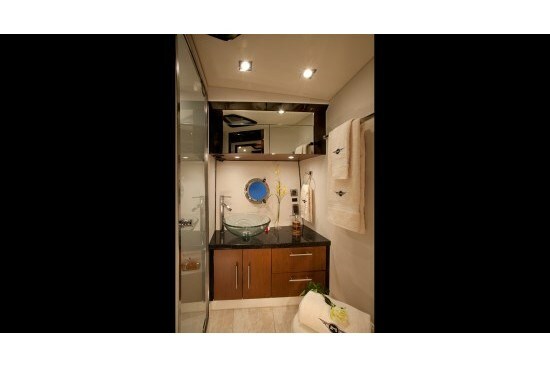 A couple of steps down and forward is the portside head with marble flooring, vessel sink, VacuFlush® toilet, overhead skylight and separate shower stall with bi-fold glass door and shower seat. The forward master stateroom offers a queen island berth with wood headboard and pillowtop innersprung mattress with embroidered Marquis® logo fitted sheet set. A convenient bench seat with cushion is provided as well as four non-opening hullside portlights plus a translucent overhead hatch for natural lighting. The starboard side VIP stateroom features two twin berths with pillowtop innersprung mattresses, a nightstand, two opening hullside portlights plus a fixed hullside window for natural lighting. The standard equipment list is fairly substantial as you could imagine however Marquis offers a full complement of yacht amenities from which you may choose. From this list, notable options include, first of all, your choice of Volvo Penta® IPS gasoline or diesel engines up to 435 horsepower each. IPS joystick control is optional. Choose the generator size from Kohler® in gas or diesel, 10 or 13 kW. Choose from several Raymarine® navigation electronics packages. 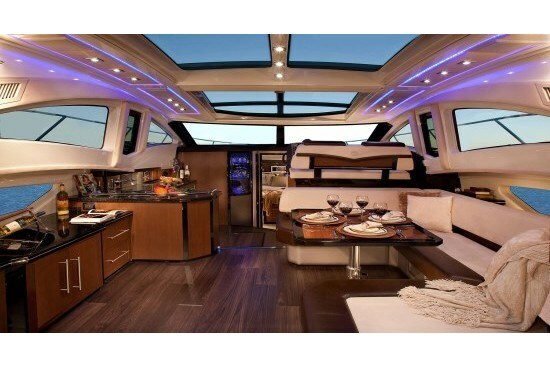 Add a cockpit table, ice maker, or refrigerator, underwater lighting, foredeck sun lounge, and a hydraulic swim platform. Inside, select from several sunroof options, stereo and television additions, central vac, and even a spa shower with massage in the head along with several décor package upgrades.